If you use an e-reader, you probably want to copy over some of your PDF files so you can read them on the go. Most e-book readers, including the Amazon Kindle and the Barnes & Noble Nook, can interpret and display the contents of a PDF file: you simply drag the file over when your reader is connected to your computer. PDF is a great format for most purposes, mainly because a PDF is designed to be completely portable and has a fixed layout no matter how you view it. That means everything stays in sync and in proportion. On an e-reader, that’s not always desirable. You can edit your PDF in Infix PDF Editor and reformat its contents for the e-reader. 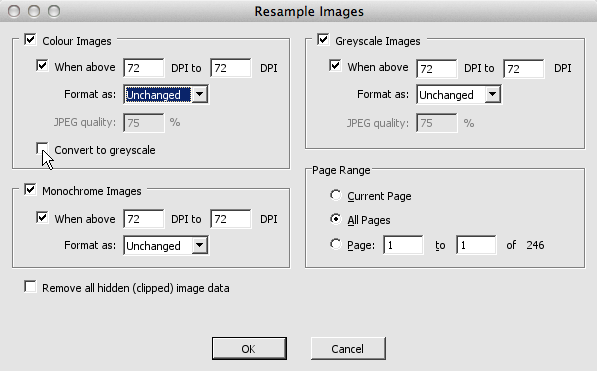 For example, you may wish to resample the images using Object -> Image -> Resample; converting all colour images to greyscale will save on storage space. Alternatively, you may want to convert your PDF to another format before attempting to read it on an e-reader device. In terms of the latter, there are two main formats to discuss: ePub and Mobi (and, to a lesser degree, AZW). The best format for conversion is ePub, providing your e-reader supports it. The Kindle doesn’t support ePub, which is where Mobi comes in. You can alter the size of the font if you load up an ePub or Mobi on an e-reader. With a PDF, you might have to zoom in and out, and that can be awkward given the fiddly controls on e-reader devices. Words in ePub and Mobi files are indexed and can be researched in your e-reader’s built-in dictionary. In an ePub or Mobi file, text reflows automatically. That doesn’t happen with PDF. The one disadvantage of ePub and Mobi conversion is that these formats don’t handle graphics particularly well. If your PDF contains a lot of images, diagrams or drawings, you may be best off sticking with it and living with the disadvantages. You can always edit your PDF in Infix PDF Editor to better arrange the layouts or change the font size. If you own any reader other than a Kindle, you’re best off converting to ePub. To actually perform the conversion, there are a number of options. Calibre is by far the most popular tool for e-book conversion, and it handles a number of key formats – and it’s free. You could use an online conversion tool, such as this one from KitPDF. It was recommended on an old Iceni blog post. The process for converting a PDF to an eBook format is roughly the same for a Kindle. Instead of converting to ePub, you’ll need to convert to a format the Kindle can use. Amazon has developed two main formats for the Kindle: Mobi and AZW. Mobi files have a .prc or .mobi file extension. They’re used for ebooks because images are very heavily compressed and converted to GIF format. If your original PDF file contains lots of diagrams, you might have to use Infix PDF Editor to remove or change some of the images prior to conversion. For the actual conversion, use Calibre or an online converter like ePub2Mobi. AZW files are similar to Mobi but the compression used is a little more sophisticated. If you want to use AZW, you can simply forward a PDF file to your Amazon Kindle email address with Convert in the subject line; it’ll come back with the AZW extension. In case web is still an option, I would go with http://in-epub.com or use Calibre for the desktop conversion. My book from create space has somehow changed from 300 plus pages to 166, with two pages per pdf page. Create space will not accept my files now because of this. I want to get my documents back so that one book page equals one pdf page. How can I do this?